Photo courtesy of Eric Stephens. Found while on a hike in China. He won’t get far on foot! No, it’s not missing. I found it in a can of whoop a$$ . . . wait, that means CHINA IS CANNING FEET! Yeti knew it was’t his hand but, his foot that was missing. And THAT, kids, is why we keep our hands and feet inside the ride at all times. dont worry larrr,i use a BIG-BIG FOOT….!!!!!!!!!!! If you have lost a foot, please go to Vancouver, BC to claim it. Be prepared to identify your lost foot [size, R/L, etc], and explain how it came to be separated from your body! Everyone who dares to cross this sacred Indian ground, shall be punished by Chief Missing Foot. …but you can chill out when the foot comes back?? This if one of my favorites. 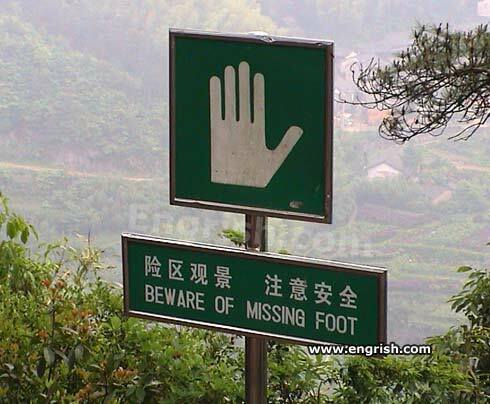 It’s as if it’s warning us about the dangers of the missing foot, but for some reason, the picture of what we’re supposed to beware of is a hand. They don’t KNOW where they’re coming from. They haven’t found any two that matched. NOOO!!! Why me?!? The foot that is disguised as a hand could attack from anywhere!!!! 5! 5 dollar foot long! i lost a foot, can someone give me a hand? the plural of foot is FEET! A sign warning of a missing foot: that’s handy. I have some odd socks for the lost foot. You know those that are left after laundry and the mate never shows up. Nasty things, missing foot bites. It may be disguised as a hand. I wonder what kind of place China would be if all those chinglish translations happened to turn out literal. Creepy. It’s typical for a fast foot to go.